I didn’t expect to do very well this time since I hadn’t been running much after the marathon. Fortunately, my bicycle-heavy downtown lifestyle came to the rescue. I tend to stand on the pedals when I ride, so my legs got some pretty good training on the way to work and back. There are three basic downtown courses for 5K races. The standard run around the Battery, the slightly adjusted run around the battery for the Laura Griffin Run, and the route which starts and ends at Joe Riley Stadium. It pretty much takes you around Hampton Park and the Citadel. I’ve just moved to Summerville again as a precursor to the big move to Burlington, so I actually had to drive in. It’s a pity, because the old apartment was right around the corner from the stadium. Luckily it was a Saturday, so the traffic was light. The event was pretty routine aside from the fact that they ran out of shirts for people who hadn’t pre-registered. I wondered who was running the event and if they had done this sort of thing before. Still, they were nice about it and promised to send me an email when new shirts were available. Everyone gathered up in the baseball stadium, as usual. 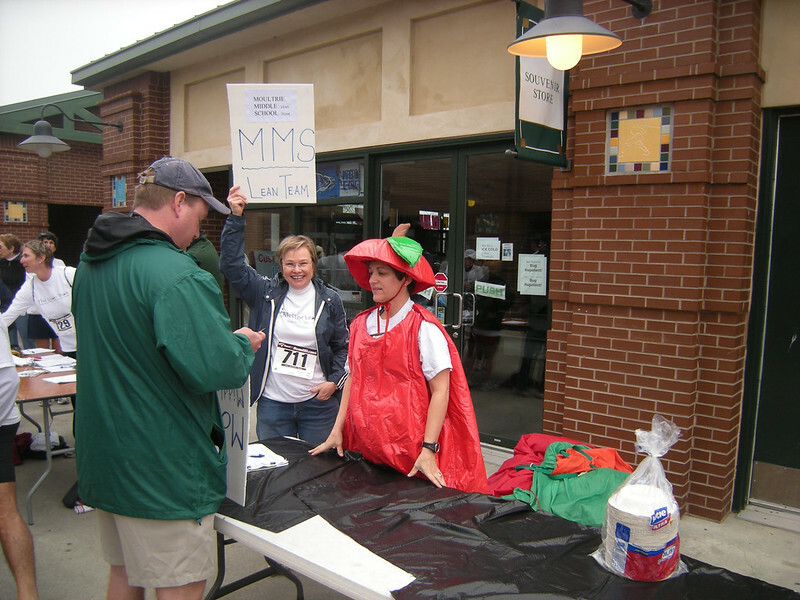 The only thing out of the ordinary was the Moultrie Middle School table. They had people dressed as fruits and veggies. I don’t know why. Sadly, I didn’t even ask. It kind of bugs me now, actually. On the bright side, maybe this is your algebra teacher below. If you’re afraid of taking her next test, just try to imagine her in this outfit. It might help you relax a bit. Unless you didn’t study, of course. In that case, you’re in the soup no matter what you do. People were rather toned down before the Start. I did see a couple of friends while I was there, and the lack of breakfast made me grateful for the fruits, bagels and Starbucks coffee which were available. There was one noteworthy event, however. It was the pre-race warm-up, led by an aerobics instructor from some gym in Mount Pleasant. Most of it was pretty routine, but some of the movements the women were doing… well, let’s just say that I was glad to be watching the crowd from behind. I took some photos and even a video, but I didn’t keep them. As nice as it was to look at, posting something like that would discourage public exercise. That just wouldn’t be a cool thing to do. I deleted several pics and the video, sticking with the more normal image below. About fifteen minutes before the race they called us to the Start. I used the time to run back to the car and stash the camera. I waited at the Start with my friend Monica for a few minutes, expecting to run with her for maybe half a mile. She was talking about catching up with me since I’m so fast. I told her that I wouldn’t be very fast this time since I had been slacking. Well, there’s a reason Monica is a successful trainer. She knows her business. When the race started, I just took off for some reason. I didn’t even know I was going to do that, but I think Monica did. I ran fast in the first mile, slowed down a bit for the second, and picked back up in the third. It was strangely comfortable. I seemed to be more aware of my body than I had been in the past. My pacing was improved, and my sense of distance was more accurate. It must have been the marathon that sharpened my skills. In the end, I crossed the Finish Line with a new 5K Personal Record of 22:35! It’s always fun to watch folks finish. They may be a little slower than I am, but I still remember when thirty minutes was a barrier for me. Running is as relative as it is subjective. If you work hard to improve yourself, then I’ll gladly stand in the sidelines and shout about how awesome you are. In the end there was a bit of hanging out and eating. I met some new folks, handed out some cards, took photos, at bagels and listened to the band. They were okay. What you see above is the single coolest thing I have ever seen at a race. 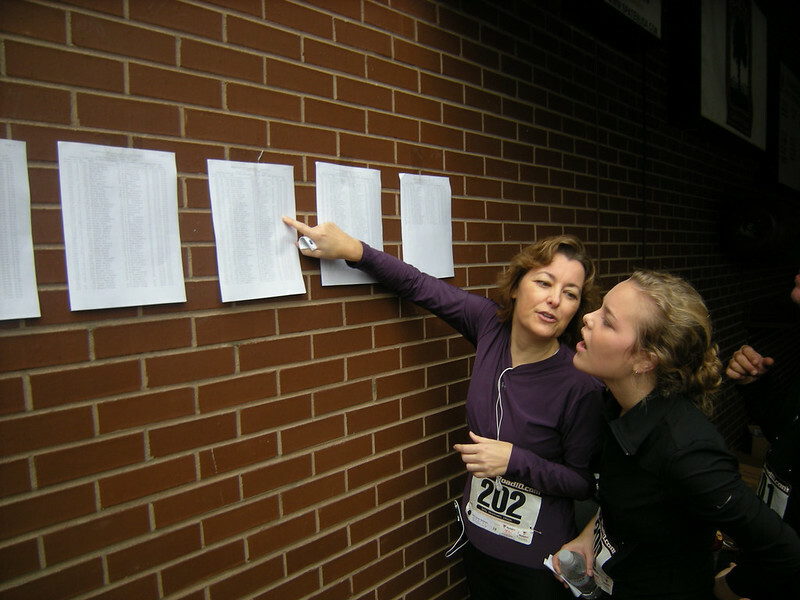 The organizers brought a printer to the course and posted the results while the race was still underway! By the time I found it we were well past thirty minutes, so most folks were on the wall. I found my time and confirmed it, and started checking out some of the more interesting numbers. The craziest entry was the winner. It was a 22-year-old guy who finished the course in 15:18! I can’t go on enough about how cool that was. It’s right up there with the new flat-strip timing chips that everyone is using these days. We were all still in the moment, and we were able to discuss numbers right there and then. I hope I see more of this at future events! It was a pretty standard event, all things considered. I was disappointed about the t-shirts, but it’s not that big of a deal. No one guarantees a shirt unless you pre-register, and they were still nice enough to get them to us at a later date. I don’t prefer this course over the Battery, but the event itself continues to improve over time. I really enjoyed it, and not just because I scored a PR!